For this week’s Beyond Beyond assignment, we were challenged to take a series of photos with a shallow depth of field, focusing on different parts of the scene. We were then to choose our favorites to post. 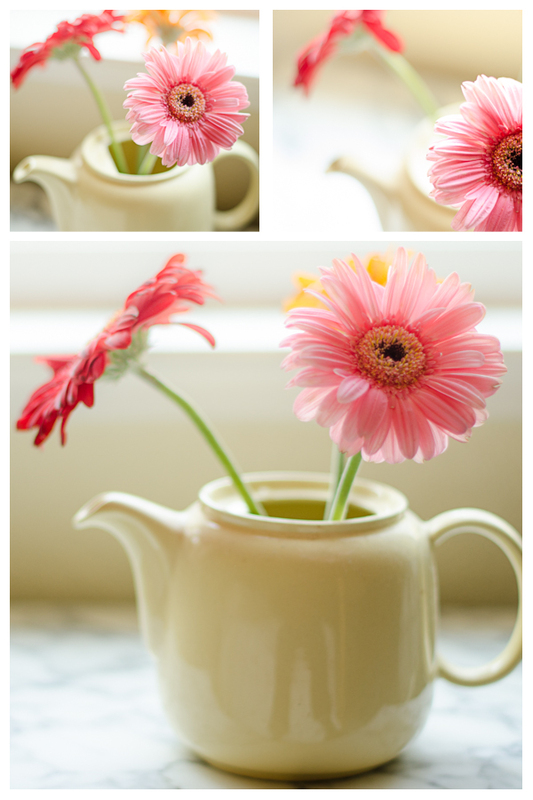 I chose my gerbera daisies, which are fading fast, for this assignment. Invariably, my favorites had the pink flower in front in focus, although I took quite a few focusing on the rear flowers or teapot. So here are the three I like best. I took these three shots using the light from my bedroom window. If you look closely at the bottom photo, you can see a reflection of me sitting on the bed! This entry was posted on February 7, 2013 by Melinda. It was filed under Beyond Beyond, flowers, still life . When I look at your pictures they just cheer me up. Beautiful job. I love gerbera and this is my favourite colour! Absolutely gorgeous light and color! Elegant work! Wow! So vivid and pretty 🙂 Love what you’ve done here, Melinda – great job! Melinda, I could not love this more!!! Lovely collage, wonderful photos of such pretty flowers ! So lovely. Great use of the beautiful light too. I love gerberas and this shows them off so beautifully!